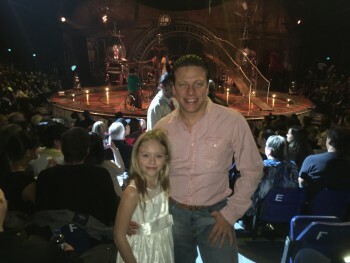 Recently I took my 8-year-old daughter Patricia to see Cirque du Soleil for the first time—and when I say, "for the first time," it was the first time for both of us. By all standards, it was a good show. Not spectacular. Not out-of-this-world extraordinary. A few years ago, we went to see some award-winning circus gymnasts and equilibrists in Russia. With 10 times less hype, THAT was truly spectacular. The point of this post is not to compare the two performances. My point is to say that in Russia, we wanted to see "a circus performance" —any circus performance—and got lucky to see something great. With Cirque du Soleil, I paid over $300 for 2 tickets precisely because I wanted to see a performance by "Cirque du Soleil." The only thing I knew about them was that they had a brand I kept seeing all the time and seeing the brand all the time was like someone whispered into my ear, "Few circuses have a brand this well-known, they got to be good!" It's like famous actors or movie directors. First they worked hard to build their reputation. And now they are paid gazillions of dollars for the mere fact that they're in the movie. In the vast majority of cases, for the movies that made these famous actors legendary, they only got paid a small fraction of what they're getting paid for some of their later works that the public rarely cares about. This brings me back to my point: whether you're an actor, a circus, or a software startup—your brand matters. Invest in building it up. Cherish it. Once it gives roots, it will feed you for the rest of your life!